Academic Info: Global Warming and Climate Change - Directory of online resources. AccuWeather - Weather forecasts, weather graphics, current weather radar, and weather data. Acid Rain Data and Reports - On-line data and reports on acid rain, atmospheric deposition and precipitation chemistry. Al Gore - Web page on climate crisis. Arctic Program (NOAA) - Synergizes the work of five NOAA line offices, each leading sustained efforts in the Arctic. Arctic Report Card - Issued annually since 2006, the Arctic Report Card is a timely and peer-reviewed source for clear, reliable and concise environmental information on the current state of the Arctic relative to historical records. Arctic Theme Page - Provides access to widely distributed Arctic data and information for scientists, students, teachers, academia, managers, decision makers and the general public. Studies now underway in the Arctic should lead to more reliable forecasts of weather over the Arctic and in heavily populated mid-latitude areas. Arctic-Boreal Vulnerability Experiment (ABoVE) - Climate change in the Arctic and Boreal region is unfolding faster than anywhere else on Earth, resulting in reduced Arctic sea ice, thawing of permafrost soils, decomposition of long- frozen organic matter, widespread changes to lakes, rivers, coastlines, and alterations of ecosystem structure and function. NASA's ABoVE's science objectives are broadly focused on (1) gaining a better understanding of the vulnerability and resilience of Arctic and boreal ecosystems to environmental change in western North America, and (2) providing the scientific basis for informed decision-making. Research for ABoVE will link field-based, process-level studies with geospatial data products derived from airborne and satellite sensors, providing a foundation for improving the analysis, and modeling capabilities needed to understand and predict ecosystem responses and societal implications. Atlantic Oceanographic and Meteorological Laboratory (AOML) - One of the Oceanic and Atmospheric Research (OAR) facilities of the National Oceanic and Atmospheric Administration (NOAA). NOAA/AOML is a part of the U.S. Department of Commerce (DOC) and is located in Miami, Florida. AOML's mission is to conduct basic and applied research in oceanography, tropical meteorology, atmospheric and oceanic chemistry, and acoustics. The research seeks to understand the physical characteristics and processes of the ocean and the atmosphere, both separately and as a coupled system. Atmospheric Composition Data and Information Services Center (ACDISC) - Ozone research. ACDISC provides convenient access to AC data and information from various remote-sensing missions, from heritage TOMS, UARS, MODIS, and AIRS datasets, to the most recent data from Aura OMI, MLS, HIRDLS as well as AC datasets residing at other remote archive sites. Atmospheric Radiation Measurement (ARM) - Program created in 1989 with funding from the U.S. Department of Energy (DOE). Sponsored by DOE's Office of Science and managed by the Office of Biological and Environmental Research, ARM is a multi-laboratory, interagency program, and is a key contributor to national and international research efforts related to global climate change. A primary objective of the program is improved scientific understanding of the fundamental physics related to interactions between clouds and radiative feedback processes in the atmosphere. ARM focuses on obtaining continuous field measurements and providing data products that promote the advancement of climate models. Avalanche - A collective group of dedicated professionals engaged in the study, forecasting, control and mitigation of snow avalanches. Bering Climate - Developing ecological and climatic indices for the Bering Sea which will serve as measures of climate and ecosystem status for the Bering Sea. The Bering Sea is one of the world's major fisheries, and fisheries from Alaskan waters represents half of the landed U.S. catch of fish and shellfish. Berkeley Earth Surface Temprerature - Researches global warming based on extensive analysis of available historical data. The study has reviewed data from over 39,000 temperature measurement stations across the globe. This is more than five times the 7,280 stations found in the Global Historical Climatology Network Monthly data set (GHCN-M) that has served as the focus of many climate studies to date. Team members include former climate change skeptics Richard Muller, Elisabeth Muller and Robert Rohde. Billion Dollar U.S. Weather Disasters - Data and narrative information on major U.S. weather disasters 1980-2003 from the National Oceanic and Atmospheric Administration. Board on Atmospheric Sciences and Climate (BASC) - Seeks to advance understanding of the Earth's atmosphere and climate, to help apply this knowledge to benefit the public, and to advise the federal government on issues within the Board's areas of expertise. Canadian Avalanche Association (CAA) - Dedicated to bringing together professionals to develop knowledge and understanding of avalanches, to encourage communication and promote industry standards, and to provide high quality avalanche education. Canadian Climate: National Climate Data and Information Archive - Official climate and weather observations for Canada. Climate elements, such as temperature, precipitation, relative humidity, atmospheric pressure, wind speed, wind direction, visibility, cloud types, cloud heights and amounts, soil temperature, evaporation, solar radiation and sunshine as well as occurrences of thunderstorms, hail, fog or other weather phenomena are warehoused in a digital database. Carbon Cycle Science Program - Provides scientific information on the fate of carbon dioxide in the environment and a scientific foundation for estimating the capacity of the land and the ocean to sequester and store the considerable quantities of carbon dioxide anticipated from human activities in the future. Carbon Footprint - Carbon footprint is a measure of the impact human activities have on the environment in terms of the amount of green house gases produced, measured in units of carbon dioxide. How big is yours ? Find out, and then do something about it. Center for International Climate and Environmental Research - Oslo (CICERO) - Conducts research and provides information about issues of climate change. CICERO's four main areas of research are (1) Atmospheric and climatic effects of emissions and emissions reductions (2) Impacts of climate change: Vulnerability, adaptation and costs, (3) Climate agreements: Design, implementation and costs, and (4) Climate policy: Instruments for national implementation. Climate Ark - Climate change news and information portal. Climate Care - Organized to tackle climate change by reducing greenhouse gases in the atmosphere by offsetting - making CO2 reductions on behalf of individuals and companies. Climate Central - News, information and research on climate change issues. Climate Change 2013: The Physical Science Basis - The Twelfth Session of Working Group I (WGI-12) was held from 23 to 26 September 2013 in Stockholm, Sweden. At the Session, the Summary for Policymakers (SPM) of the Working Group I contribution to the IPCC Fifth Assessment Report (WGI AR5) was approved and the underlying scientific and technical assessment accepted. Climate Change Futures - A project by The Center for Health and the Global Environment at Harvard Medical School that examines the health, ecological and economic risks of climate instability. Climate Change Impacts on the U.S. - Public comment web-site for the draft report Climate Change Impacts for the U.S.: The Potential Consequences of Climate Variability and Change. Climate Change Science - Study prepared by the U.S. National Academy of Sciences to provide the White House with assistence in climate change issues. Published in 2001. Climate Indices for the Economy - Eestablished at National Climatic Data Center to enhance the understanding of weather and climate's effects on socioeconomic sectors of the United States. Climate Institute - Works to protect the balance between climate and life on earth by facilitating discussion among scientists, policy makers, business executives and citizens. The Institute strives to be a source of objective, reliable information. Climate Intervention: Carbon Dioxide Removal and Reliable Sequestration (2015) - As one of a two-book report, this volume of Climate Intervention discusses CDR, the carbon dioxide removal of greenhouse gas emissions from the atmosphere and sequestration of it in perpetuity. Climate Intervention: Carbon Dioxide Removal and Reliable Sequestration introduces possible CDR approaches and then discusses them in depth. Land management practices, such as low-till agriculture, reforestation and afforestation, ocean iron fertilization, and land-and-ocean-based accelerated weathering, could amplify the rates of processes that are already occurring as part of the natural carbon cycle. Other CDR approaches, such as bioenergy with carbon capture and sequestration, direct air capture and sequestration, and traditional carbon capture and sequestration, seek to capture CO2 from the atmosphere and dispose of it by pumping it underground at high pressure. This book looks at the pros and cons of these options and estimates possible rates of removal and total amounts that might be removed via these methods. Climate Intervention: Reflecting Sunlight to Cool Earth (2015) - As one of a two-book report, this volume of Climate Intervention discusses albedo modification - changing the fraction of incoming solar radiation that reaches the surface. This approach would deliberately modify the energy budget of Earth to produce a cooling designed to compensate for some of the effects of warming associated with greenhouse gas increases. The prospect of large-scale albedo modification raises political and governance issues at national and global levels, as well as ethical concerns. Climate Intervention: Reflecting Sunlight to Cool Earth discusses some of the social, political, and legal issues surrounding these proposed techniques. Climate Prediction Center - The home of the official U.S. climate outlooks. Popular products: El Nino/La Nina Advisories, U.S. Hazards Assessment and Drought Assessment. Climate Reality Project - Bringing the facts about the climate crisis into the mainstream and engaging the public in conversation about how to solve it. Founded and chaired by Al Gore, Nobel Laureate and former Vice President of the United States. Climate Registry - A nonprofit partnership developing an accurate, complete, consistent and transparent greenhouse gas emissions measurement protocol that is capable of supporting voluntary and mandatory greenhouse gas emission reporting policies for its members and reporters. Provides a verified set of greenhouse gas emissions data from its reporters supported by a robust accounting and verification infrastructure. Climate Research Unit (CRU) - One of the world's leading institutions concerned with the study of natural and anthropogenic climate change. Climate Vulnerability Monitor - Co-published by DARA and the Climate Vulnerable Forum, a partnership of seriously affected nations initiated in 2009 by the Government of the Maldives. The Initiative also supports strong climate leadership among most vulnerable countries. climateprediction - A climate prediction model organizaed by researchers at the University of Oxford to be run on home/ school/ work computers. By getting data from thousands of climate models, it plans to generate the world's largest climate prediction experiment. Cloud Types and Classifications - Clouds pictured, identified, and classified. Cooperative Program for Operational Meteorology, Education and Training (COMET) - Meteorology education and training, program information, workshop and teletraining schedules, computer-based learning module descriptions and sales information, outreach program opportunities, and general information about COMET activities. DataRefuge - An initiative committed to identifying, assessing, prioritizing, securing, and distributing reliable copies of federal climate and environmental data so that it remains available to researchers. Defence Meteorological Satellite Program (DMSP) - The DMSP program designs, builds, launches, and maintains several near polar orbiting, sun synchronous satellites monitoring the meteorological, oceanographic, and solar-terrestrial physics environments. Discovery of Global Warming - The history of scientific work on climate change from the 19th century to 2001, told in a set of hyperlinked essays. Earth Observatory - Showcases NASA's latest Earth science research, focusing on global climate change, remote sensing, and unusual events. Earth System Research Laboratory - Studying atmospheric and other processes that affect air quality, weather, and climate. Chemical Sciences Division - Quantifying the processes that control the chemical makeup of Earth's atmosphere. Global Monitoring Division - Providing information on atmospheric constituents that drive climate change, stratospheric ozone depletion, and baseline air quality. Global Systems Division - Conducts research and development to provide NOAA and the nation with observing, prediction, computer, and information systems that deliver environmental products ranging from local to global predictions of short-range, high impact weather and air quality events to longer-term intraseasonal climate forecasts. Physical Sciences Division - Conducts weather and climate research to observe and understand Earth's physical environment, and to improve weather and climate predictions on global-to-local scales. Environmental Defense: Climate - Works to stabilize Earth's climate by reducing the emission of greenhouse gases. Global and regional air quality is another major area of action. Environmental Protection Aency (EPA) Global Warming Site - Presents accurate information on the issue of climate change and global warming. Exxon Secrets - How Exxon funds climate change skeptics. FEMA: Climate Change - Provides information about climate change and links to related FEMA (Federal Emergency Management Agency) tools and documents. Fourth International Climate Assessment (USGCRP, Nov 2018) - Assesses the science of climate change and variability and its impacts across the United States, now and throughout this century. Gateway to the United Nations Systems Work on Climate Change - The Intergovernmental Panel on Climate Change (IPCC) has been established by the World Meteorological Organization and the United Nations Environment Programme to assess scientific, technical and socioeconomicinformation relevant for the understanding of climate change. Reports by the three Working Groups, gathered here, provide a comprehensive and up-to-date assessment of the current state of knowledge on climate change. Geophysical Fluid Dynamics Laboratory - Research to expand scientific understanding of the physical processes that govern the behavior of the atmosphere and the oceans as complex fluid systems. These systems can then be modeled mathematically and their phenomenology studied by computer simulation methods. Global Carbon Project - The growing realization that anthropogenic climate change is a reality has focused the attention of the scientific community, policymakers and the general public on the rising concentration of greenhouse gases, especially carbon dioxide (CO2) in the atmosphere, and on the carbon cycle in general. The scientific goal of this project is to develop a complete picture of the global carbon cycle, including both its biophysical and human dimensions together with the interactions and feedbacks between them. Global Change Data and Information System (GCDIS) - Global change research. Global Climate Change - The Government of Canada's web site on global climate change. Global Environement Facility (GEF) - Helps developing countries fund projects and programs that protect the global environment. GEF grants support projects related to biodiversity, climate change, international waters, land degradation, the ozone layer, and persistent organic pollutants. Global Warming - News on global warming. Global Warning: Early Warning Signs - Global temperature map illustrates the local consequences of global warming. Global Warming: The Pew Center on Global Climate Change - Provides a forum for objective research and analysis and for the development of pragmatic policies and solutions to address issues of global climate change. Gravity Recovery and Climate Experimentt (GRACE) - Twin satellites launched in March 2002 that are making detailed measurements of Earth's gravity field which will lead to discoveries about gravity and Earth's natural systems. See more info at Wikipedia and JPL. Green House Network - Provides global warming education programs. Greenhouse Gas - A Wikipedia article. Greenland Ecosystem Monitoring - A leading integrated monitoring and long-term research programme on ecosystems and climate change effects and feedbacks in the Arctic. Hadley Centre for Climate Prediction and Research - Provides a focus in the United Kingdom for the scientific issues associated with climate change. Heat Is On - Global climate change resources, articles, and news. Household Emissions Calculator - A software tool that: allows you to estimate your personal co2 emissions, compares your emissions to the average for your province or territory, offers hints and tips to reduce emissions, shows specific reductions acheived for different steps taken, provides up-to-date information on climate change and links to other important sites. Ice2Sea - Working to improve projections of the contribution of ice to future sea-level rise. IceBridge: Antarctica - IceBridge, a six-year NASA mission, is the largest airborne survey of Earth's polar ice ever flown. It will yield an unprecedented three-dimensional view of Arctic and Antarctic ice sheets, ice shelves and sea ice. These flights will provide a yearly, multi-instrument look at the behavior of the rapidly changing features of the Greenland and Antarctic ice. Institute of Arctic and Alpine Research (INSTAAR) - Research, education, and outreach related to Earth System Science and Global Change in high-latitude, alpine, and other environments. Institute for the Study of Society and Environment - Focusing on earth system-society interactions, societal resilience to weather and climate hazards, the hydrologic sciences, and biogeochemistry. Intellicast - Local weather, U.S. Radar, U.S. Satellite, U.S. NEXRAD, weather, forests, travel and traveler health information, tropics, and more. Interactive Weather Map - An animated map of global wind and weather. Also see more at Earth Facebook and War in Context pages. Intergovernmental Panel on Climate Change (IPCC) - The role of the IPCC is to assess the scientific, technical and socio-economic information relevant for the understanding of the risk of human-induced climate change. It does not carry out new research nor does it monitor climate related data. It bases its assessment mainly on published and peer reviewed scientific technical literature. See the IPCC Working Group I Fourth Assessment Report Summary for Policymakers. Investor Network on Climate Risk (INCR) - Promotes better understanding of the risks of climate change among institutional investors. Jenifer Clark's Gulfstream - Using infrared imagery, satellite altimetry data, and surface isotherm data, oceanographic analyses are produced and available for the Gulf Stream area and all the major currents of the world. Laboratory of Tree Ring Research - University of Arizaona, Tucson. The primary mission of the Laboratory of Tree-Ring Research is to apply dendrochronology (the study of tree rings) to improve understanding of natural environmental variability in climatic, hydrologic, geomorphic, and ecological systems and their interactions with human societies. Live Weather Images - Current weather images in general, current regional images, forecast maps, satellite imagery, European images, bodies of water data, seismic activity, city and regional doppler radars, movie loops, surf information, aviation information, and weather cams. Also: Calculate sunrise/sunset times, calculate heat index and wind chill values, get up to the minute National Weather Service forecasts for your local area, and check tide predictions. NASA Earth Observatory - New satellite imagery and scientific information with a focus on the Earth's climate and environmental change. NASA Goddard Institute for Space Studies (GISS) - GISS is primarily engaged in studies of global climate change. Current research at GISS emphasizes a broad study of global change, which is an interdisciplinary initiative addressing natural and man-made changes in our environment that occur on various time scales - from one-time forcings such as volcanic explosions, to seasonal/annual effects such as El Niño, and on up to the millennia of ice ages - and that affect the habitability of our planet. National Atmospheric Deposition Program (NAPD) - A nationwide network of precipitation monitoring sites and cooperative effort between different groups, including State Agricultural Experiment Stations, U.S. Geological Survey, U.S. Department of Agriculture, and numerous other governmental and private entities. National Center for Atmospheric Research (NCAR) - Established in 1960 to serve as a focus for research on atmospheric and related science problems. Recognized for its scientific contributions to our understanding of the earth system, including climate change, changes in atmospheric composition, Earth-Sun interactions, weather formation and forecasting, and the impacts of all of these components on human societies. National Centers for Environmental Prediction (NCEP) - NCEP, a critical part of the National Oceanic and Atmospheric Administration's National Weather Service, is the starting point for nearly all weather forecasts in the U.S.
National Climate Assessment - The Global Change Research Act of 1990 mandates that the U.S. Global Change Research Program (USGCRP) deliver a report to Congress and the President no less than every four years that “1) integrates, evaluates, and interprets the findings of the Program…; 2) analyzes the effects of global change on the natural environment, agriculture, energy production and use, land and water resources, transportation, human health and welfare, human social systems, and biological diversity; and 3) analyzes current trends in global change, both human-induced and natural, and projects major trends for the subsequent 25 to 100 years. National Climatic Data Center (NCDC) - World's largest archive of weather data. NCDC operates the World Data Center for Meteorology, Asheville. See Most Popular Products/Most Requested page. National Environmental Satellite, Data, and Information Service - The NOAA/NESDIS mission is to provide timely access to global environmental data from satellites and other sources to protect the U.S. economy, security, environment, and quality of life. 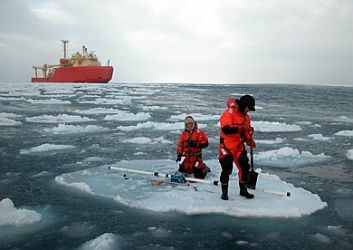 National Ice Center - Quality operational global regional and tactical scale sea ice analyses and forecasts tailored to meet the requirements of U.S. national interests and provide selected METOC services to specified DOD agencies in the Washington D.C. area. National Oceanic and Atmospheric Administration (NOAA) - An organization of the Department of Commerce, NOAA is comprised of the National Ocean Service, National Weather Service, National Marine Fisheries Service, National Environmental Satellite Data, and Information Service, and Office of Oceanic and Atmospheric Research. Warns of dangerous weather, charts seas and skies, guides the use of ocean and coastal resources, and conducts research. National Oceanic and Atmospheric Administration (NOAA): Data Center (NODC) - U.S. repository and dissemination facility for global environmental data. National Oceanic and Atmospheric Administration (NOAA): Drought Information - A roundup of the various NOAA websites and information on drought and climate conditions. National Oceanic and Atmospheric Administration (NOAA): Earth System Research Laboratory (ESRL) - ESRL was formed to pursue a broad and comprehensive understanding of the Earth system. This system comprises many physical, chemical and biological processes that need to be dynamically integrated to better predict their behavior over scales from local to global and periods of minutes to millennia. Chemical Sciences Division (CSD) - Discovering, understanding, and quantifying the processes that control the chemical makeup of Earth's atmosphere to better understand its future. Global Monitoring Division (GMD) - Providing the best possible information on atmospheric constituents that drive climate change, stratospheric ozone depletion, and baseline air quality. Also see Up-to-date weekly average CO2 at Mauna Loa. Global Systems Division (GSD) - Conducts research and development to provide NOAA and the nation with observing, prediction, computer, and information systems that deliver environmental products ranging from local to global predictions of short-range, high impact weather and air quality events to longer-term intraseasonal climate forecasts. Physical Sciences Division (PSD) - Conducts weather and climate research to observe and understand Earth's physical environment, and to improve weather and climate predictions on global-to-local scales. National Geophysical Data Center - Manages environmental data in marine geology and geophysics, paleoclimatology, solar-terrestrial physics, solid earth geophysics, and glaciology (snow and ice). National Polar-Orbiting Operational Environmental Satellite System (NPOESS) Preparatory Project (NPP) - The NPP mission collects and distributes remotely-sensed land, ocean, and atmospheric data to the meteorological and global climate change communities as the responsibility for these measurements transitions from existing Earth-observing missions such as Aqua and Aura, to the NPOESS. It will provide atmospheric and sea surface temperatures, humidity sounding, land and ocean biological productivity, and cloud and aerosol properties. National Snow and Ice Data Center (NSIDC) - Supports research into our world's frozen realms: the snow, ice, glaciers, frozen ground, and climate interactions that make up Earth's cryosphere. Manages and distributes scientific data, creates tools for data access, supports data users, performs scientific research, and educates the public about the cryosphere. NSIDC distributes more than 500 cryospheric data sets for researchers, from both satellite and ground observations. See Data at NSIDC to browse its holdings, get information, and download or order data sets. National Virtual Data System - Provides access to data and products from the National Oceanic and Atmospheric Administration. Search for data using Atlas, Category, Keyword, or Region databases. Doppler Radar National Mosaic - Latest weather radar images. International Weather Conditions - Weather conditions for the past 24 hours world-wide. Radar Graphics - Local and national radar products from the U.S. National Weather Service, including the latest images and animations for your area. U.S. Weather- Weather conditions for the past 24 hours, forecasts, watches, and warnings for the U.S. Weather Maps - Facsimile charts produced by the U.S. National Weather Service. NOAA Earth System Research Laboratory (ESRL) - Work includes understanding the roles of gases and particles that contribute to climate change, providing climate information related to water management decisions, improving weather prediction, understanding the recovery of the stratospheric ozone layer, and developing air quality forecast models. North Pole Environmental Observatory (NPEO) - An automated scientific observatory in the Central Artic Ocean. Northern Climate ExChange (NCE) - Created in response to growing concern over the impacts of climate change on the land, life, and communities of northern Canada. The effects of climate change are projected to be greatest and to come most swiftly to the polar regions of the world, and there is growing evidence that the impacts of climate change are already being noticed in these regions. While the focus of the work of the NCE is on activities within the Yukon, the NCE has received funding to undertake projects that are relevant across northern Canada. Old Weather - Attempting to gather more information about historical weather variability, to improve our understanding of all forms of weather variability in the past and so improve our ability to predict weather and climate in the future. Paleoclimatology Program - A central location for paleoclimate data, research, and education provided by the National Oceanic and Atmospheric Administration (NOAA). Potsdam Institute for Climate Impact Research - Researchers from the natural and social sciences working in the fields of global change, climate impacts and sustainable development. RealClimate - A commentary site on climate science by working climate scientists for the interested public and journalists that provides a quick response to developing stories and context often missing in mainstream commentary. Research Applications Laboratory (RAL) - RAL scientists and engineers work closely with other centers and agencies, as well as the aviation industry, to improve the timeliness, accuracy, and presentation of weather information to better predict, detect and warn of atmospheric hazards that significantly affect aviation commerce. Scripps Climate Research Division - CRD scientists study a broad range of phenomena spanning time scales from a few weeks to several decades. Research themes include predicting the natural variability of climate and understanding the consequences of man-made increases in the greenhouse effect. Sea Level Flood Maps - For east coast of the United States. Data via NASA. Information on methodology here. Skeptical Science - The goal of Skeptical Science is to explain what peer reviewed science has to say about global warming. When you peruse the many arguments of global warming skeptics, a pattern emerges. Skeptic arguments tend to focus on narrow pieces of the puzzle while neglecting the broader picture. For example, focus on Climategate emails neglects the full weight of scientific evidence for man-made global warming. Concentrating on a few growing glaciers ignores the world wide trend of accelerating glacier shrinkage. Claims of global cooling fail to realise the planet as a whole is still accumulating heat. This website presents the broader picture by explaining the peer reviewed scientific literature. Snow Crystals - All about snow crystals and snowflakes. Southern Regional Climate Center (SRCC) - One of six NOAA Regional Climate Centers administered by the National Climatic Data Center (NCDC). The SRCC serves the six-state region that includes Arkansas, Louisiana, Mississippi, Oklahoma, Tennessee, and Texas. Its services and research help to explain climate and its impacts in the South, provide practical solutions to specific climate problems, and allow us to develop information about climate-sensitive issues such as agriculture, climate change, energy, tropical storms, the environment, human health, risk management, transportation, and water resources. SpaceWeather - Science news and information about the Sun-Earth environment. State of the Climate - A summary of global and US national temperatures and precipitation, placing the data into a historical perspective. Provided by NOAA. Surging Seas - A report and a map, and also the name of Climate Central's program on sea level rise. Today's Space Weather - Presented by the Space Weather Prediction Center, providing real-time monitoring and forecasting of solar and geophysical events, conducts research in solar-terrestrial physics, and develops techniques for forecasting solar and geophysical disturbances. Tyndall Centre for Climate Change Research - Through its research, training and outreach activities the Tyndall Centre seeks to engage with stakeholders and to explore and develop new technologies, lifestyles, economic instruments and regulatory mechanisms that will allow climate change to be managed. U.S. Climate Action Report (2002) - A U.S. State Department publication. U.S. Country Studies Program - Provides financial and technical assistance to developing and transition countries for climate change studies. U.S. Current Surface Analysis - Via Intellicast. U.S. Drought Monitor - A synthesis of multiple drought indices and impacts, that represents a consensus of federal and academic scientists. U.S. Environmental Protection Agency (EPA) Global Warming Site - information on climate change and global warming. U.S. Global Change Research Program (USGCRP) - Global change data and research, including a continuously-updated catalog that provides a comprehensive list of global change-related data available from federal agencies. U.S. National Assessment Climate Change - This Assessment has begun a national process of research, analysis, and dialogue about the coming changes in climate, their impacts, and what Americans can do to adapt to an uncertain and continuously changing climate. UNEP: Climate Change - UNEP raises awareness on climate change through information and media activities, supports the UNFCCC Secretariat with its media needs and the IPCC information and outreach activities, including electronic publishing of IPCC reports, and facilitates sub-regional and national climate change outreach campaigns. Unidata - Atmospheric and related data sponsored the by the National Science Foundation. Unisys Weather - Graphical weather information. United Nations Framework Convention on Climate Change (UNFCC) - Provides parties, representatives of observer organizations, and others interested in the UNFCCC process, with a one-stop source of news, data, information and documents. University Corporation for Atmospheric Research (UCAR) - As a consortium of universities dedicated to education and research to enrich understanding of the earth system. UCAR manages the National Center for Atmospheric Research (NCAR) and the UCAR Office of Programs (UOP). Weatherbase - Historical weather records and averages and more. Comprehensive information for over 16,400 cities worldwide. Western Regional Climate Center (WRCC) - Climate and weather information, precipitation maps, climate monitoring. one of six regional climate centers in the U.S.
What Could Disappear - These interactive maps from the NYT show coastal and low-lying areas that would be permanently flooded, without engineered protection, in three levels of higher seas. Percentages are the portion of dry, habitable land within the city limits of places listed that would be permanently submerged. What's Up With the Weather? - NOVA and Frontline programming and resources on global warming. Wind Map - This map shows you the tracery of wind flowing over the U.S.
World Bank Carbon Finance Unit (CFU) - CFU uses money contributed by governments and companies in OECD countries to purchase project-based greenhouse gas emission reductions in developing countries and countries with economies in transition. The emission reductions are purchased through one of the CFU's carbon funds on behalf of the contributor, and within the framework of the Kyoto Protocol's Clean Development Mechanism (CDM) or Joint Implementation (JI). World Data Center A, Meteorology (WDC-A) - One component of a global network of discipline subcenters facilitating international exchange of scientific data. This webpage last updated on Saturday, December 15, 2018 9:03 AM.